I am in love, love, love with these raw hemp seed brownies. 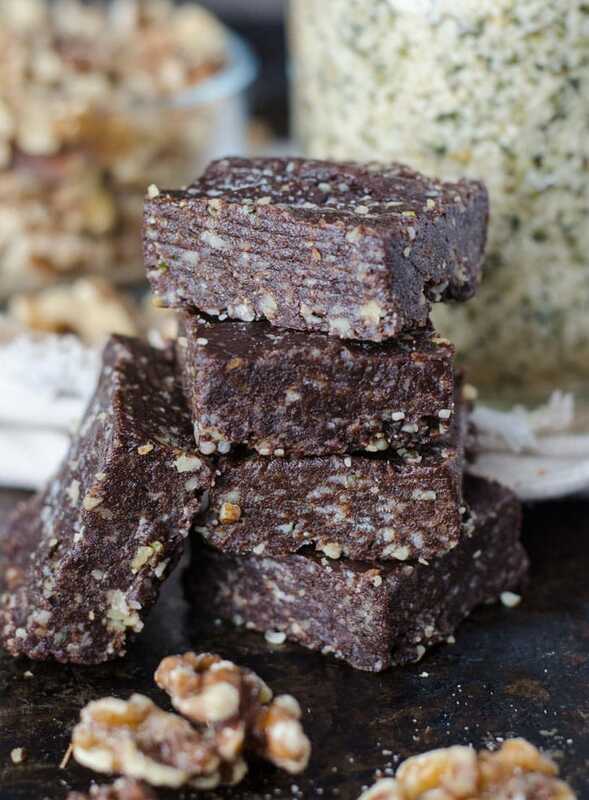 You’ll only need 4 ingredients to make them: walnuts, hemp seeds, dates and cacao, there’s no baking required, they have no added sugar and they’re so nutritious you can enjoy them for breakfast, dessert or a snack anytime you feel like it. Amazingly rich and decadent chocolate flavour and texture. These are a must-try! You guys know how much I love hemp seeds. I include them in my recipes all the time. From No-Bake Cinnamon Raisin Hemp Seed Balls, to Raw Hemp Seed Maca Balls, to Vegan Tahini Hemp Seed Bars, I love these superfood seeds. and more…if there was one food that truly deserves to be called a superfood, hemp seeds just might be it. Hemp seeds are also one of the best foods you can eat for a balance of omega 3, 6, and 9 is hemp seeds. 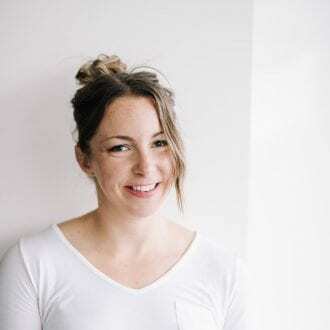 Not only is hemp a good source of omega-3 but it’s also very high in minerals, in particular, magnesium which is good for actually metabolizing that omega-3. Hemp also contains manganese which is good for ligament and tendon pain, zinc which is important for prostate health and testosterone production and iron which plays a roll in oxygen-carrying red blood cell production. Hemp seeds are very easy to incorporate into your diet. You can a few tablespoons to your daily smoothie, sprinkle them on oats, add them to salads or even just eat them on their own. They have a delicious nutty flavour and make a wonderful addition to any diet for all the amazing health benefits they offer. But mostly…just use them in raw hemp seed brownies so you can enjoy all these health benefits AND eat a brownie. Win win. You can make these with regular processed cocoa powder or cacao powder. I recommend using cacao for its nutritional benefits but if you prefer, you can definitely use regular cocoa powder. For best results, use a kitchen scale to weigh ingredients. Use parchment paper, wax paper or saran wrap to line your baking dish so you can easily lift these out to cut into squares. These can be cut into 16 squares coming in at 160 calories each, or you can make 8 large energy bars of 328 calories each. These will keep in the freezer for months or the fridge for a week or so. They can be enjoyed straight from the freezer as they will not freeze solid. Each brownie contains 8.7 grams of fat most of which is polyunsaturated fatty acids. Each brownie is 164 calories with 17 grams of carbohydrates, 8.7 grams of fat and 5 grams of protein. They’re high in minerals and antioxidants, especially if you use cacao and not regular cocoa powder. The perfect chocolate flavour, the perfect chocolate texture and loads of nutrition despite the fact they taste like a rich and decadent dessert. 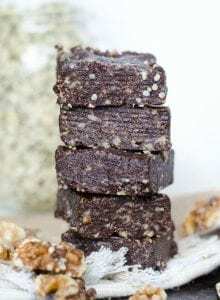 These can be enjoyed as a homemade energy bar, a balanced breakfast, for dessert or for a delicious and energizing snack anytime you need it. Add all ingredients to a food processor and mix until it forms a dough. Press the dough into a square baking pan lined with parchment, wax paper or saran. Place in the freezer for a couple hours to firm. Lift out of the pan and cut into 16 squares. These look amazing and I love the ingredient list. I make raw ones but really love the added texture in these and I bet they’re really filling! They are, and they’re sooo yummy!! I have been obsessed with no bake desserts this summer and brownies are my fav – can’t wait to try this easy recipe! I love no-bake desserts too, I rarely actually bake anything these days..no-bake is just so quick and easy!! Hope you enjoy them. These look delicious, i love raw treats like this! Lovee how nutritious these are! I bet these taste magnificent as well. Chocolate in all forms please! I wish I had time to make these before my long run this weekend. Maybe I’ll make them after for dessert. 🙂 They look delish!! These look phenomenal! Never knew it was that easy to make raw brownies! Drooling!!! Love how simple these are – I’m all about a good date sweetened recipe! Ok I make brownies *at least* 3x/week. I’m not exaggerating either…momma needs her chocolate. These look amazing and I love that they only have 4 ingredients! I need to add more hemp to our diet! These are such a great idea! They look DELICIOUS. Can’t wait to try out this recipe! Love hemp seeds for two reasons: hemp milk and hemp brownies. Enough said!!! I’ve had raw brownies with walnuts, but never with hemp seeds added. I bet they add such a nice crunch! I’m a sucker for brownies! 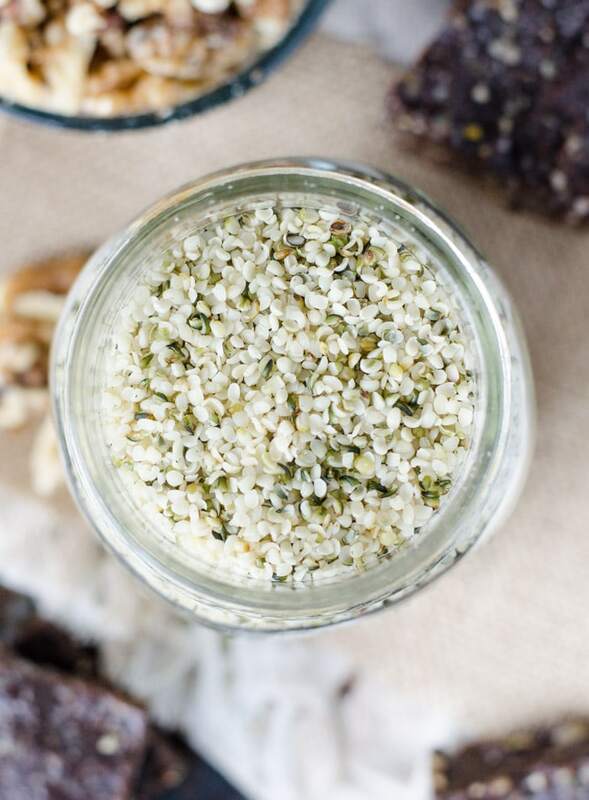 I actually dont think I’ve ever tried hemp seeds, but will have to try this recipe out for a healthier version! Totally, give it a try!! They’re so easy and so yummy! You mention that for best results the ingredients should be weighed. Do you have the ingredients list in grams as well? Thank you so much. Can’t wait to test these brownies. Sorry, yes I do! I forgot to add them..thanks!! I’ll add them in now. Thank you so much for the weight measurements. They just went into the freezer and they look amazing! Huge fan of your blog ???? Awesome. I hope you like them, let me know!! And thanks so much! I read ONE comment from someone who actually MADE the brownies. Would like to read comments from people who have tried these and not just fans of the written recipe. Sorry there aren’t more comments from people who have made but I can tell you I’ve made them many times and they are always delicious! Love these! I recently found your site and this is the 5th recipe I’ve tried and I’m obsessed with them all! I love having something healthy on hand to satisfy my sweet tooth. Easy to make and delicious! Thanks, for the recipe! Just out fo curiosity, how do you get stuff from Thrive Market as a Canadian? I don’t, I just wanted to share it with my American readers and have friends that use it in the US and love it. One of my favourite recipes…. so easy to make and delicious. A great little treat when you need to satisfy that afternoon sweet tooth. Thanks, Brenda! I appreciate the feedback and I’m so glad you like them! I’ve been following a vegan diet for a week now and every recipe I have used has come from this site. I am so grateful, especially for the treats which are so easy and yummy. These are perfect and will be a perfect treat for me! Thank you! When you say soft dates do you mean soaked in water? These sound wonderful. I’m going to try them out. No, you don’t need to soak them if they’re already fresh and soft. If your dates are dry and hard then soak them first. Enjoy!! First time I made these they were amazing! So of course I had to make them again. Second time round I couldn’t get the ingredients to go doughey. I ended up with crumbs that won’t stick together. I measured everything out. What did I do wrong and how can I fix it ? Did you use different dates? If they were too dry the dough will not stick together (if using dry dates, soak them in hot water for 15 minutes before using). Adding a few splashes of water should help it form a dough. Hope they work out!